There is a great deal of confusion when you try to research ancesters before they were entered into the U.S. Census. It is possible that Matilda was owned by a man named Saud McAllister in Montgomery County, Georgia. This maybe why her name was McAllister. I received information from another researcher that there was a young girl that was the same age as Matilda would have been at the time in the property records of Saud McAllister. The question would be if she was a Horn before being sold to McAllister. I was told by my Aunt Susie that her name was Matilda Horn. On her death certificate, her son John Franklin Matilda's mother was Susan House, but I have yet to find any other records on either of them, not even her brother, Andrew (Andar) Horne. There is an Andrew Horne 6 years old living next door to Matilda McAllister in the 1870 census. He is living with a Jane and Frederick Hall. Now this could very well be her brother. Matilda's mother was Susan Horne(House) and her father was Jack Horne, who was a free man of color in 1854, whose guardian was Jacob Clements;this information was found in the Montgomery County courthouse by Antonio McMillian, who is also a descendent of the Hornes. It is believed that Susan, the mother of Matilda was the slave of Farquar McRae, along with her mother Matilda,sister Mary, and brother Nelson. Susan was willed to his daughter Margaret who later marries Jacob Clements. This is probably how Jack Horne and Susan McRae came in contact. Now we do not know if Jack was ever a slave or not. My cousin Jesse McRae seems to believe that Susan's sister Mary is the mother of Moses McRae which would make Mose and Matilda first cousins. What Jesse believes is that Mary and Nelson got together because their slave owners were next door to each other, and I believe these owners were also brothers. Also when you find Andrew Horne next door to Matilda McAllister in the 1870 census, he is in fact her brother, as well as Jane Horne Hall. There were other children between Jack Horne and Susan McRae, Matilda, Jane, Elijay, Lewis,Esauph and Isabel and Andrew. Lewis was the Lewis McAllister that was in the house of Matilda in the 1870 census. I knew that he was probably not her child because he was only 12 years younger than Matilda. This is great way to keep your family informed. Thanks. This I believe is going to become much bigger than it is right now. A great deal of work, but so enlightening. Great blog and comments Tonya. According to Andrew's death certificate his mother was Susan McRae and father Jack Horne. 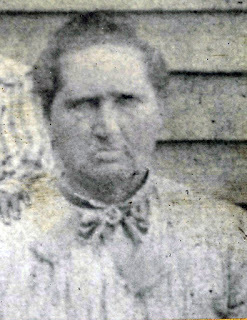 The problem for those of us in Matilda's line as well as those researching Jack Horne is explaining how Jack (a free man of color as you state) could father several children with Susan (known slave of Farquhar McRae) as far back as 1847. We know that according to the 1870 and 1880 census Jack was married to a woman named Mary and had several children. Many of the children that he and Susan are claimed to share would have been fathered the same time he was married to Mary and fathering children with her. Also, the marriage certificate sent to me by Antonio for Susan and Jack states that they were married in 1873. This is a year after Moses and Matilda married and conflicts with Jack being married to Mary on the 1880 census. While some have a direct line to Jack through Andrew, that is not true for us who come through the Matilda line (although they may be half siblings). Further, on the 1900 census Matilda claims that her father was from North Carolina. Additionally, why is that Matilda's mother is Susan on her death certificate but her father is "unknown?" Being the oldest child, surely she would have passed on to her children if her father were Jack since she clearly told them who her mother was. Finally, on the 1870 census, why does Matilda insist that she is a McAllister as well as on her 1872 marriage license when she had the opportunity to set the record straight if it were Horne? As you state, there is a lot to de-conflict before we can claim Jack Horne as the father of Matilda and most evidence points to this not being so. The Horne connection for those of us through the Matilda line may be through any children that Susan shared with Jack but I continue to search for confirmation of who Matilda's father may be. Keep up the great work on the blog. I too have some doubts about Jack being Matilda's father. Even Emma, Matilda's first born, who was about 9 mos old when Matilda married Mose. She went as Emma McRae most of her life,but stated her name as Emma McAllister when she got married. But I do believe without any proof that McAllister was a slave masters name, as there were other children in the 1870 census with Matilda with the surname McAllister that turned out to be her siblings. This also explained their being in her household when at least one of them, Lewis was too old to be her child. Per Antonio McMillian, Lewis McAllister and Lewis Horne are one in the same; but Matilda seems to be the oldest child we know of. You too keep up the good work and keep me posted. I am going to go back and find the many emails that you have sent to me and post them on this blog as well. There is still so much wok to do.